Although the Eurozone economic recovery continues, Markit’s latest PMI (Purchasing Managers’ Index) for December shows a wide difference between the two largest economies, France and Germany. 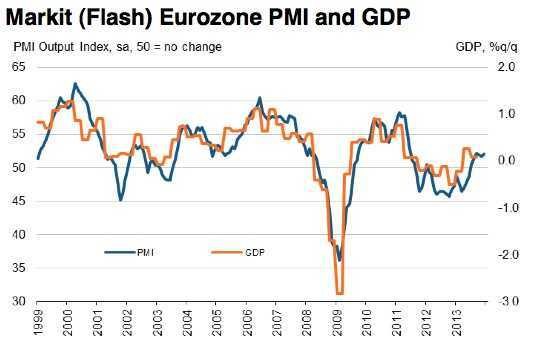 The flash Market Eurozone PMI Composite Output Index increased to 52.1 in December compared to 51.7 in November, bringing the reading close to the 27-month peak seen in September. New orders growth showed the biggest increase in demand for goods and services since June 2011. Manufacturing has been rising for six consecutive months, reaching its highest level since April 2011. New orders were driven by rising exports. Although activity in the service sector has increased for five successive months, December saw the third month of more moderate growth. High unemployment is keeping consumer services demand low. Germany, however, looks set for a 0.5% expansion in GDP. Last week, Eurostat, the EU’s statistical office, reported that industrial production fell 1.1% in in the Eurozone in October and 0.7% in the whole European Union (including non Eurozone members).